The installation "temple" is composed of a series of created spaces reflecting aspects of a ritual healing journey from emotional disconnection to re-integration. From exhibition to place of reflection the linear structure of the installation offers participation in a changing process of observation and contemplation. Article on ‘temple’ by Michelle Brown, curator of Illuminated Manuscripts at the British Library. 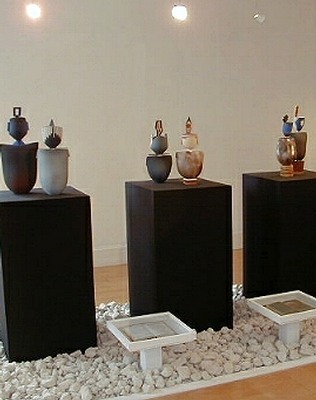 Shown at the Hotbath Gallery, Bath 1999, with the support of Hotbath gallery, City of Bath College, South West Arts, Arts Council South West, Falmouth College of Arts and collectors of ceramics.